Sunday evening was a fantastic night if you’re a fan of Argo, Seth MacFarlane, James Bond, or movie musicals. But it was an equally great night if you’re a fan of movie math. In my second year predicting the Oscars with only math, my model went 17-for-21, including correct calls in the tense races for Best Picture and Best Director. Let’s take a look at what went right and what went wrong for statistics in Hollywood. First, we’ll turn our attention to the closest races which Ben’s Oscar Forecast picked correctly. Best Director: Ang Lee – Life of Pi. This was a very controversial category. Many “experts,” including some people endeavoring to use statistics, picked Steven Spielberg for Lincoln. Mathematically speaking, though, my model found it wasn’t that close. When I crunched the numbers, Spielberg was down at 10%, even behind David O. Russell for Silver Linings Playbook and Benh Zeitlin for Beasts of the Southern Wild. Why? There are a few reasons, but the biggest is that Mr. Spielberg did not receive a BAFTA nomination, which hurts him severely in a model using data from the past 15 years. Best Picture: Argo. Many correctly called this award, while a few picked Lincoln as the favorite. While it is true that Argo was not nominated for Best Director, that is not nearly as important as the plethora of predictors Argo had going for it. For that reason, my model put Lincoln way down at 9%, with Argo up at 60%. Best Writing – Adapted Screenplay: Argo. Others had Silver Linings Playbook, but anyone who put enough weight on the Writers’ Guild for this category got this one correct. Best Animated Feature: Brave. The other popular pick was Wreck-It Ralph. This shows why it’s a dangerous pitfall to put too much weight on the Annies and the Producers Guild. The other factors, the BAFTAs and the VES awards, made Brave was the clear frontrunner. There were also plenty of categories that most other statistical prognosticators did not attempt. 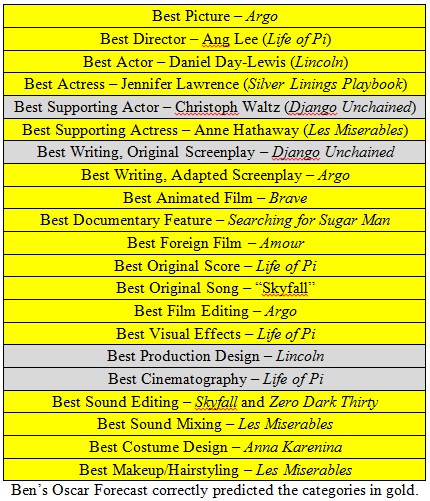 My model correctly predicted Life of Pi for Best Original Score and Best Visual Effects, Argo for Best Film Editing, Anna Karenina for Best Costume Design, and Les Miserables for Best Makeup/Hairstyling and Best Sound Mixing. It also called Skyfall for Best Sound Editing, which split the award with Zero Dark Thirty, the first tie in 18 years. Almost every predictor, including my model, picked Daniel Day-Lewis in Lincoln for Best Actor, Jennifer Lawrence in Silver Linings Playbook for Best Actress, Anne Hathaway in Les Miserables for Best Supporting Actress, Amour for Best Foreign Film, Searching for Sugar Man for Best Documentary – Feature, and “Skyfall” for Best Original Song. In 4 of the 21 categories, the mathematical frontrunner which I calculated and the winner did not correspond. Three of them were simply extremely tight races. Christoph Waltz, who won Best Supporting Actor for his role in Django Unchained, was only 9% behind leader Tommy Lee Jones. Lincoln took Best Production Design despite falling 8% below Anna Karenina. Best Cinematography went to Life of Pi, though the math put it 3% behind Skyfall. From a mathematical perspective, these results are all entirely reasonable and expected, since the differences were so slight. The only category with a larger difference was Best Writing – Original Screenplay, where second-place Django Unchained beat first-place Zero Dark Thirty. The mathematical suggestion partially rested on Zero Dark Thirty’s win at the Writer’s Guild, but Quentin Tarantino was ineligible for a Writer’s Guild award for his Django Unchained script under the WGA’s restrictive rules. The overall lesson: math is an extremely powerful tool for prediction, working at an 81% clip on this occasion. But absolute perfection is unlikely to be found on a calculator; I’d prefer to look for it in a great movie. Do you have any similar questions that you’d like me to calculate? Just leave a comment below and I’ll respond with the percent chance of your scenario coming true. If the numbers hold true, look for the wealth to be spread around at the Oscars this year. I have created a statistical model to predict the Oscars, using numerical data from critic scores, other awards shows, and guild awards over the past 15 years. This method is entirely mathematical: no personal hunches are taken into account. Last year, my model correctly predicted all eight of the major categories. This year’s final tallies show that six movies will take home multiple awards this Sunday. On the flip side, no movie will win more than three for the first time since 2005. The “big winner,” if any movie even deserves that title, will most likely be Argo, claiming Best Picture, Best Adapted Screenplay, and Best Film Editing. In a very tight Best Director race, Ang Lee (Life of Pi) is the slight favorite. However, Life of Pi is only expected to win two other awards – Best Original Score and Best Visual Effects – despite its 11 nominations. The acting awards are not as close, mathematically speaking. Check off Daniel Day-Lewis (Lincoln), Jennifer Lawrence (Silver Linings Playbook), Tommy Lee Jones (Lincoln), and Anne Hathaway (Les Miserables) on your Oscar ballots without too much worry. The biggest lock goes to an often overlooked category. Searching for Sugar Man is expected to win Best Documentary with 80%, the best odds for any nominee this year. Other races will be a lot closer. Skyfall, at 30%, leads Best Cinematography over Lincoln (29%) and Life of Pi (27%) by the slimmest of margins. Don’t get up for more popcorn during that award. And Anna Karenina, expected to win for Best Production Design and Best Costume Design, is similarly unsafe in both of those categories. For the full list of predictions, please see www.oscarforecast.wordpress.com/predictions. Where exactly do these numbers come from? I explain the methodology at www.oscarforecast.wordpress.com/about. For more trivia, follow me on Twitter at www.twitter.com/BensOscarMath, or go to www.oscarforecast.wordpress.com/trivia. Movies have the benefit of perfectly polished scripts, crafted and edited by the world’s greatest wordsmiths. But what happens when the moviemakers walk onstage to accept the highest prize in their profession, filled with surprise and emotion but lacking a script? The top ten words are unsurprising: and (spoken 3,679 times over the last 20 years), to (2,923), the (2,502), you (2,807), thank (2,044), I (1,904), my (1,525), of (1,343), for (1,220), a (1,200). When Meryl Streep took home the Best Actress award for The Iron Lady last year, some commentators called it a “lifetime achievement award,” implying that she beat out the competition more due to her body of work than her performance in that film. Others have speculated that veterans are more likely to win Oscars because they are more talented than their peers – the reason they are veterans in the first place. But does any of this actually correspond with the facts? The answer, perhaps surprisingly, is no. Despite the beliefs that veteran actors win more awards for their talent or their career achievements, veterans actually win 17% less often than relative newcomers. Here, we will define an Oscar veteran as an actor who has received more than five nominations either in the lead or supporting category. There are currently 33 members of this exclusive club, with the newest – Denzel Washington – just added this year thanks to his sixth acting nomination for his role in Flight. In the 84 years of Oscars (excluding this year), there have been, coincidentally, 84 acting nominations for those I have defined as Oscar veterans, counting only nominations after their first five. In these nominations, only 14 times has a veteran emerged victorious, for a rate of 16.7%. The overall average for acting nominees is 20%, since one out of five wins each category. Technically, before 1936 the number of acting nominations varied each year, but the first Oscar veteran was Norma Shearer, who did not receive her sixth nomination until 1938 for Marie Antoinette. With a little help from inflation and a lot of help from eager moviegoers, 2012 broke many records at the box office. For the first time, each of the ten highest-grossing films earned over $600 million. But don’t look for The Avengers, The Dark Knight Rises, or Skyfall (2012’s three billion-dollar hits) to take home the top prize at the 85th Academy Awards. As a matter of fact, none of the top ten earners received a Best Picture nomination. This is the eighth time that this occurred, along with 1984, 2004-2008, and 2011. But it hasn’t always been this way: The Academy’s and the box office’s top choices used to match up quite frequently. In 1949, 1950, 1953, and 1962, all Best Picture nominees made the top ten. The most top-ten grossing movies to receive a Best Picture nomination in one year was seven in 1934. The Best Picture winner made the top ten money-making list 14 years in a row between 1934 and 1947, the longest streak in history. There are even two pairs of back-to-back Best Picture winners which were also the highest-grossing film of the year: You Can’t Take It with You (1938) and Gone with the Wind (1939), along with My Fair Lady (1964) and The Sound of Music (1965). Since the 85th Academy Awards nominations were announced, Lincoln has emerged as the tentative frontrunner among a plurality of headline writers, bloggers, and oddsmakers. This was fueled in large part by the fact that Steven Spielberg’s Civil War epic garnered 12 nominations, the most of any film. But does receiving the most nominations really mean that a movie is most likely to win Best Picture? The short answer is yes – 2/3 of the time. But for movie buffs and math nerds, here is the longer answer. Over the 84 years of Oscars, the movie that received the most nominations (including ties for first place) among the Best Picture nominees went on to take the top prize in 56 years, exactly 2/3 of the time. The higher a movie ranks in nominations among its Best Picture competitors, the more likely it is to win: 85% of winners came in the top two in nominations, and 93% of the winners at least made bronze. So should you go ahead and fill out your Oscar ballot with Lincoln or Life of Pi, this year’s runner-up with 11 nominations?